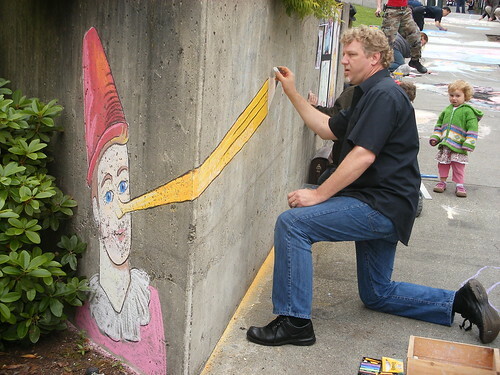 Remember when Lance won "Best Illustrator in the Universe (of Tacoma)" for his pinnocchio/RR piece? The time has come to build his trophy, and YOU are invited! 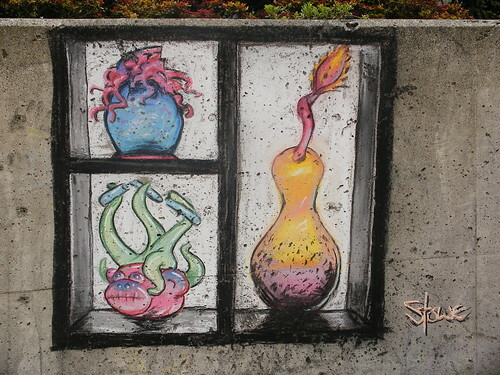 What: Chalk Artist Night at Hilltop Artists hot shop! Where: Jason Lee Middle School Hot Shop, corner of Sprague and Division/6th Ave.
We will be making Lance his "Greatest Illustrator in the Universe (of Tacoma)" custom made glass prize. We will have light refreshments, demos by our talented production team and some cool folks to network with. 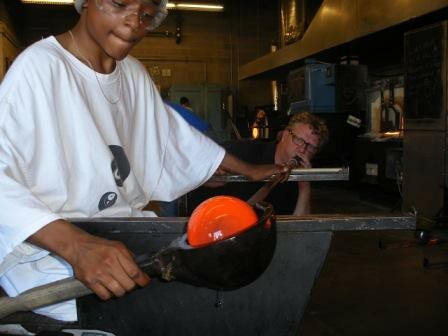 Perhaps a bit of hands-on (so to speak) experience with molten glass. Spouses and SO's are welcome to attend. I need a number to determine how much food to get, so let me know if you can attend. by NineInchNachos on 7/3/2008 @ 6:15pm Thanks Kathy! by Erik on 7/3/2008 @ 8:34pm Sounds like a great event Kathy. Each week, the frost park challengers have battled it out at Frost Park in a sort of Theater in the Round. Now we get to see the Hilltop Artists in Residence make trophy for Lance Kagey("Loves the MM Bridge so much .....") for prevailing in a Frost Park Chalk Off Episode. The expectations are high for constructing Lance's trophy which no doubt will be well photographed. We look forward to the event and the glass trophy produced. by kathy on 7/4/2008 @ 11:55am Thanks Erik! by KevinFreitas on 7/7/2008 @ 9:54am I'm there, thanks so much Kathy. Can't wait! Lance and family, the Stowes, Dawn, Kevin....RR is that a confirmation? Erik? Please let me know if you can come so I can get enough FOOD! by jenyum on 7/8/2008 @ 12:07am I'll be there if I can get a sitter! by izenmania on 7/8/2008 @ 8:17am Alas, not I. Final rehearsal for a gig at Rhapsody in Bloom the next night. by Mandiferous on 7/8/2008 @ 8:27am Sure! Sounds like fun. by droid116 on 7/8/2008 @ 10:02am Sounds great. Would love to be there but need to confirm. Should know by end of day. by Dave L. on 7/8/2008 @ 11:50am I'm not worthy, but sure, I wouldn't want to miss a chance like this! Count me in!. by droid116 on 7/8/2008 @ 11:53am I am now confirmed. by kathy on 7/8/2008 @ 5:42pm Yay!! Ordered food today...the kids are excited. by Dave L. on 7/9/2008 @ 12:01pm This is going to be so cool - Thanks for doing this for us. Please let us know if we can bring anything, too. Afterwards, if any chalkies want to head back to Frost to clean last week's chalk, we could do that. (But that's another topic and another blog.) We're sure looking forward to this evening! by Erik on 7/9/2008 @ 8:36pm Did you get a picture of Lance's chalk off trophy that was made? Wonderful to see you Lance and family, Sto and Courtney, Dawn, Kevin, Andrew, Jen, RR and Darcy, Dave L and your wonderful, adorable and extremely well behaved and polite children! Thank you all for coming...we had a nice turnout...met some cool folks. by Erik on 7/10/2008 @ 1:17am Wow. That's a high tech cake. The frosting must have taken hours. 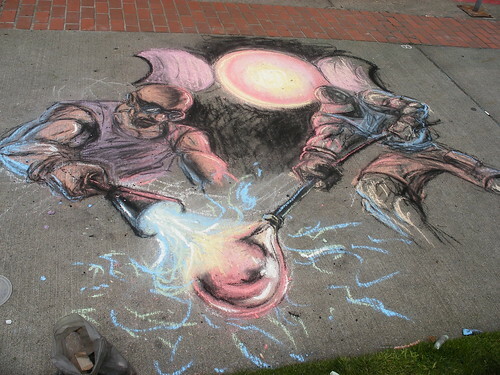 Thanks again to Kathy and company for sponsoring that recent chalk off and letting us enjoy their hot shop. by jamesstoweart on 7/10/2008 @ 8:17am Those pics are great! And I want to wish Kathy another Happy Birthday blogosphere style. by Elle on 7/10/2008 @ 8:54am Oh I would have totally been there had I been a good blogger and read the actual feedtacoma front page yesterday (sorry Kevin). Dang. by Dave L. on 7/10/2008 @ 10:28am We owe YOU the thank you, Kathy! What a fun learning experience. It's so neat when you can also feel the heat. Yummy food, too. 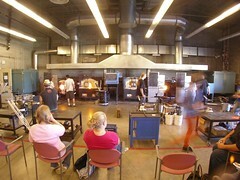 Thanks to you and the crew also for being so kind and generous to my little future glass-blowers. by droid116 on 7/10/2008 @ 12:25pm Had a great time. It was my first time at the hot shop and it was fascinating. I have some pictures but will take a little time to get them posted.